Sen. Elizabeth Warren, D-Mass., wants "ultra-millionaires" to pay a 2 percent annual tax on assets over $50 million. Sen. Bernie Sanders, I-Vt., who is weighing another presidential run, is calling for new estate tax rates as high as 77 percent on billion-dollar-plus inheritances. Both proposals came not long after Rep. Alexandria Ocasio-Cortez, D-N.Y., called for a 70 percent tax rate on income over $10 million. Other plans were already floating around the Democratic primary field before last month and it's likely more will follow. Sen. Cory Booker, D-N.J., wants higher estate taxes to finance a "baby bond" for every child. Sen. Kirsten Gillibrand, D-N.Y., and Sanders have teamed up on a bill to tax financial transactions, a concept Sen. Kamala Harris, D-Calif., also says she supports. "Taxing the rich has probably been the most popular Democratic policy as long as I've been looking at Democratic polling," Jon Favreau, a former speechwriter for President Barack Obama, told NBC news. Within the Democratic Party's left wing, many see Trump's presidency as an opportunity to turn the clock back to a time before President Ronald Reagan's popular small-government pitch put Democratic leaders on the defensive over taxes. As politicians like Warren and Sanders often note, the top income tax rate was at least 70 percent until the 1980s and even hit 94 percent during World War II. "We started bargaining against ourselves, and I think it created a fear of being bold and a fear of being definitive," New York City Mayor Bill de Blasio, who has urged Democrats to make taxing the rich a political focus, told NBC News. "Then you fast forward all the way up to 2016, and a whole lot of voters — people who have been (Democratic) voters throughout their lives — couldn't even recognize their party." Trump, hoping to win back voters who abandoned the GOPin the midterm election last year, has hammered the tax proposals as part of his broader argument that Democrats have become too radical. "You know, it's interesting. I've been watching our opponents, our future opponents, talk about 70 percent," Trump told reporters last month. "What happens is you really have to study what's happened to Venezuela. It's a very, very sad situation." "There is a sense that it's important to have very concrete proposals that could be implemented in 2021 if the Democrats win the White House and Congress," said University of California-Berkeley professor Gabriel Zucman, an economist specializing in inequality whom both Warren and Sanders cited in announcing their tax plans. While taxes on the rich alone couldn't offset single-payer "Medicare for All," which some estimates suggest would add $32 trillion in federal spending over 10 years, they could finance a variety of other high-profile Democratic agenda items. "If you put Medicare for All to one side, you can start talking about all the other proposals: debt-free college; free college for all; a child-care program; massive infrastructure investment; paid family leave," Linden said. Brian Riedl, an economist at the Manhattan Institute who has advised Republicans, argues that while it's "mathematically possible" to raise several trillion dollars from higher income households alone, he's skeptical that either Warren's wealth tax or a new 70 percent tax rate could hit their revenue goals. That's because they'd likely cause the rich to change their behavior to avoid the tax. "Wealthy people would start putting their money where it can minimize taxes instead of where it can finance investments and economic growth," he said. 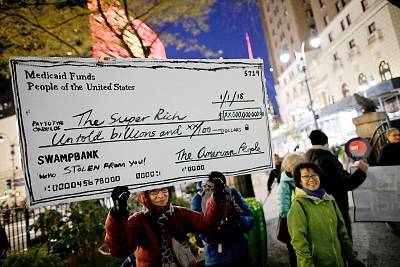 To some advocates for higher tax rates on the rich, raising revenue isn't the only point, it's also about changing how the 1 percent behave. Especially among more left-leaning lawmakers, the argument isn't just that billionaires need to pay more taxes in order to finance Democratic programs. It's that the proliferation of billionaires is a threat in and of itself — and that knocking them down a peg would be a public good. 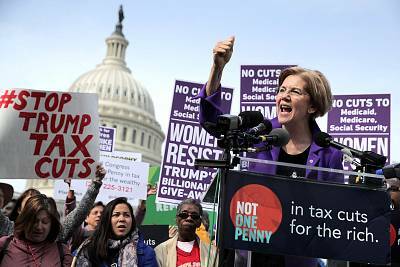 "The consequence of having amassed that much wealth is bad for our economy," Warren said in an interview explaining her wealth tax on MSNBC's "All In" last month. Warren said that having a small group of people making decisions that always tend to favor a lot of big corporations is bad for democracy, because it means "a democracy that is influenced by the wealthy, the well-connected and is not working for the people." Warren has tangled early on with Michael Bloomberg and Howard Schultz, two billionaires weighing self-funded runs for president who have been critical of Democratic proposals to tax the rich. Schultz cited Ocasio-Cortez's call for a 70 percent tax in explaining why, if he runs, it won't be as a Democrat. 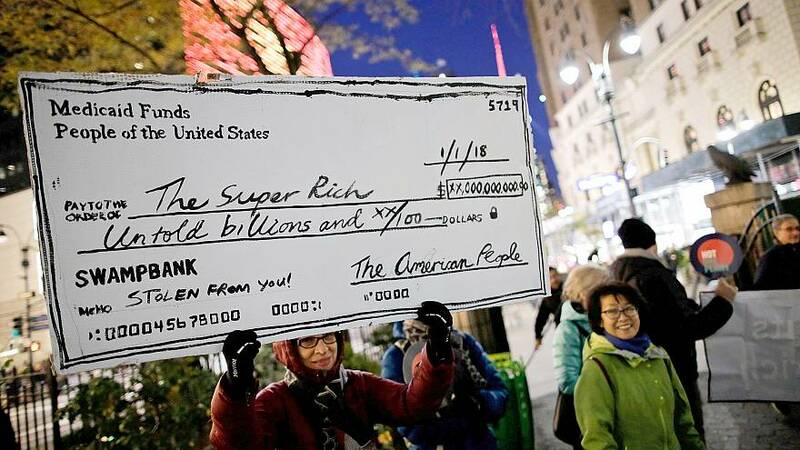 "The big question was whether you can have a functioning democracy when you have a small number of people with staggering loads of wealth," Edward T. O'Donnell, a history professor at the College of the Holy Cross, said in an interview. "The fear of a rising aristocracy within a democracy was quite real."